Hi, I am interested in your 1966 Chevrolet Chevelle (stock #5125-CHA) listed on Autotrader for $43,995. I'd like to get more information about this vehicle and confirm its availability. 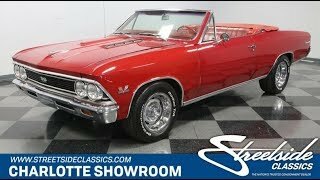 This 1966 Chevrolet Chevelle convertible is a real-deal Super Sport thats finished in a cool red on red color combo. But while it has great classic looks, upgrades like the fuel-injected big block, overdrive transmission, and A/C means youre looking at quite a nice custom machine. This car is quite striking from its first impression in the way it mixes speed with sophistication. The 66 cars blend artful touches (like the subtle Coke-bottle curves) with refined aggression (like the intimidating hint of overhang on the hood.) This is a real-deal SS car, and so it has all the right pieces, including the simulated hood vents, rocker trim, and full badging. Plus, the Super Sports blacked-out grille and rear not only look good against the red paint, but also they coordinate nicely with the newer black folding roof. And the hint of forward-leaning stance is a clue that this SS has a true beast within. While the black roof looks nice, theres just something special about a red convertible with a red interior that gives this a bit of European flair. A true Super Sport also means bucket seats and a center console. Plus, you get other great vintage elements like the classic dual-spoke factory steering wheel that gives you a clear view to the speedometer thats as long as the horizon. If you look closely, youre going to spot some nicely integrated upgrades, like R134a air conditioning. Plus, the auxiliary gauge trio gives you a full picture about whats going on under the hood and this one has a lot in the engine bay. The 396 cubic-inch V8 has that great big block look with a bright orange block, shining valve covers, and an air topper with callouts. As you look a little closer, youre going to notice some really terrific upgrades. It starts with a FAST fuel injection system. This V8 now exhales with authority as the headers add even more power while feeding the StainlessWorks dual exhaust. It gives this big block the sweet rumble a ferocious motor like this deserves. But more than just a great muscle car, you want a convertible Chevelle to be a great cruiser. So they upgraded the transmission to Chevys 700R4 four-speed automatic. Its ideal for quick kick-downs for performance as well as slipping into overdrive comfort for easy highway driving. Plus, theres a large aluminum radiator to help keep this one running cool in all conditions. Add in power steering and front disc brakes, and soon you can see this powerful muscle car is a great all-around droptop classic. This is a true SS convertible with all the right upgrades. Its great for driving right now and taking to the next level over time. So dont miss this deal. Call now!